For years, architects have needed a system to bridge the gap between galvanized chain link and ornamental fencing at an affordable cost. The latest technology in tube mill operations and powder coatings have been combined with Ameristar's state-of-the-art manufacturing facility to produce a "superior" quality chain link fence framework, at a cost that is competitive with single coat polyester or vinyl tubings. Durability -- For years, architects and fence contractors have been asking for a superior coating finish that can withstand the rigors of shipment and installation and result in a project with a beautiful "up close" appearance at completion. Ameristar's Color Chain Link Fence Framework is the solution! UV Resistance -- Ameristar's Color Chain Link Fence Framework has "superior" ultra-violet characteristics which far exceed vinyl clad systems, in South Florida exposure, as shown in the test results below. Maintenance Free -- The galvanized steel substrate combined with the "superior" maintenance-free Permacoat Color System results in unsurpassed product life expectancy which far exceeds the performance of other coating finishes. 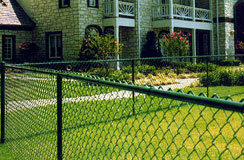 Warranty -- A written 10 year limited warranty is extended on Ameristar's Color Chain Link Fence Framework.